The last 6 months or so have been a whirlwind! We’re nearing the end of the school year, and when I look back I’m amazed at how far my 7-year-old has traveled academically. This is a child that, at the beginning of the school year, could neither read nor write. He also couldn’t identify half of his lowercase letters (and don’t even get me started on sight words). It should be mentioned that he has an autism spectrum disorder that has made learning a bit of a tricky process for him. That said, he’s now reading at a 2nd-grade level and writing up a storm – according to him he’s even in the process of authoring a book about natural disasters. Because he’s not a traditional learner, my son really appreciates educational apps that provide an element of fun and imagination. This helps keep my somewhat unfocused early reader engaged in the learning experience without feeling bored or unchallenged by the app’s content. Having fun is probably every app developer’s secondary goal when making an educational app for kids and some miss the mark by a long shot. Artgig Apps, however, seems to hit the bullseye each time; their their latest vocabulary boosting app Mystery Word Town upholds Artgig’s commitment to quality learning through the iPad. My son learned how to read using a less traditional whole-word memorization method and he can sometimes get easily frustrated by reading or vocab apps that prompt players to sound out letters or syllables of words. When I explained Mystery Word Town to him he didn’t seem to keen on trying it, but slowly became more intrigued by the Wild West theme that’s characteristic of Artgig learning apps. He warmed up to the idea of playing and as soon as he was roped in to the story line, he easily got the hang of playing and even – gasp!! – started to enjoy it. We’ve played other Artgig apps before so we knew the backstory and the basic game play directions (which were a little confusing to find). On the Easy setting my son was able to be challenged without being stumped and quickly caught on, swiftly moving through the two other difficulty settings. He chose to use the settings that read the words out loud and set about spelling words and collecting gold. I checked the word list for each ability level and they’re all appropriately assigned to their difficulty category (I compared them to some sample word lists for different grades in elementary school). We are still playing Mystery Word Town, which is an indication (at least in my house!) that it’s a solid, well-executed app that engages and challenges young learners. 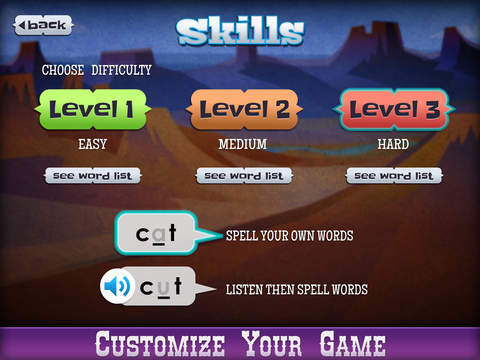 Mystery Word Town is designed for early readers ages 6-8 and costs $2.99 in the App Store. UPDATE: The latest update really kicked this app into high gear! Now kiddos can record their own words and create custom word lists. Have fun with this feature – try recording silly voices to keep kids engaged and laughing while learning. This not only adds a truly interactive element to the game, but it also makes it versatile enough for every reading skill level. As a parent, I love the idea that Mystery Word Town can grow with my kids!